When Stephanie Demetrelis was 13, she bent over a coffee table at her home – and in that one second, her life changed. My mom was like,”Oh my goodness, what’s wrong with your back?” Stephanie recalls. One shoulder blade looked higher than the other, making her appear to have a hump on her back. Stephanie’s mother, Sandra, took her to an orthopaedist, who referred Stephanie to a scoliosis specialist, Max W. Cohen, MD, founder of Spine & Scoliosis Specialists in Greensboro. Dr. Cohen, a fellowship-trained specialist, diagnosed idiopathic adolescent scoliosis, noting a double curve measuring 40 degrees during his initial evaluation in 2003. Because Stephanie’s curve was so severe and she was already through most of her growth spurt, she was not a good candidate for a brace – which sometimes can stop further progression during the growth spurt. Instead, Dr. Cohen asked her to return for check-ups at regular intervals to track changes. “About a year after that, I started having problems with my back,” Stephanie says. She had been a basketball player when she was younger, but gave that up her freshman year of high school due to pain. In high school, she took up golf and soon made her school’s golf team. Even as she grew more skilled in that sport, Stephanie was enduring regular pain, and her curvature grew worse – progressing to 46 degrees by 2006. 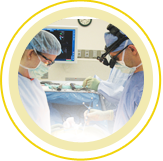 Typically, doctors consider surgery when the curvature is 45 or 50 degrees, or if the patient has pain or decompensation (where the head moves out of alignment with the spine). Stephanie and her parents, Sandra and Gary Demetrelis of Archdale, NC, remained hesitant about surgery. After Stephanie graduated from Vandalia Christian School in 2008, she received a golf scholarship to attend Catawba College in Salisbury, NC. College brought long golf workouts and intensive study sessions, and her discomfort grew worse. The tipping point came in October 2008, when pain caused her to withdraw from a tournament after the first round. “I was hurting so bad,” she says. I went back to Dr. Cohen and I was like,”I have to get the surgery; I have to get it because I can’t even live a normal life.” Everything I did was so painful. After returning to Catawba to complete the semester, she had difficulty sitting in class or working on the computer for long periods. Surgery was scheduled for just after the Christmas break and she planned to take the next semester off to recuperate. During the surgery on January 6, 2009, Dr. Cohen used a state-of-the-art technique to straighten Stephanie’s curved spine – utilizing screws, hooks, titanium rods and a Dacron band called a universal clamp. Stephanie was the first scoliosis patient in the U.S. to benefit from the clamp, which Dr. Cohen helped develop for U.S. use with Abbott Spine. Bone grafts were then laid over her spine to create a “scaffolding” for the vertebra to grow together in the new straightened position. “We’re actually tricking the body into thinking it has a fracture that needs to heal,” says Dr. Cohen. 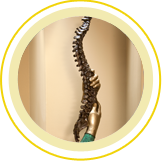 Key to the success of the procedure is the “hardware” used to straighten the spine. It holds the vertebra in place while the bone grafts grow together. Stephanie spent a week in the hospital, feeling pretty “miserable,” she says, and another month recovering at home before she began feeling a lot better. Gradually, Dr. Cohen allowed more activity, and in July 2009, Stephanie began practicing golf again. Stephanie was elated when, two weeks after she began practicing again, she won the girls’ High Point Junior Golf Championships in her age division. In fall 2009, she returned to college and the golf team at Catawba College. By spring of 2010, she was finding the rigors of four-hour practices, long tournaments and college too much and decided not to continue in competitive golf. “I still play but for fun now,” she says. In fall 2010, she transferred to the University of North Carolina at Greensboro to major in travel and tourism. She is amazed that she can sit in class or work at a computer for hours without pain. Her advice for other young scoliosis patients who are in pain and considering surgery?